For more than 30 years, the staff at Cedar Knoll Hunting Lodge has been committed to delivering the leading hunting services to guests from across the nation. Located near the Savannah River south of Fairfax, South Carolina in the beautiful South Carolina Lowcountry, our lodge features everything you need for an unforgettable hunting trip with your hunting buddies. Measuring 5,600 square feet, the lodge and recreation hall we have historically used offers all of the comforts of home during your trip. These fully furnished facilities sleep thirty guests with private rooms available upon request. Additionally, the dining hall, great-room, large game room, regulation pool table, big-screen television, and central heat and air conditioning add to the enjoyment of our guests. Adjacent to the lodge and recreation hall are the RV park, bath house, pavilion, camp fire, barbecue, and game processing facilities. The minimum-hunting pressure with appropriate rest periods, intensive habitat management, and the year-round feeding program have enabled Cedar Knoll Hunting Lodge customers to experience a success rate of well over 70% on bucks 2.5 years or older. Customers average approximately 8 points and 15 inches in width and a similar success rate on hogs in recent years as our owners have continued to hone their approach. In 2016 we will be offering executive accommodations in the 4,250 square foot executive lodge, used formerly as the “residence” of Dona’s parents with three large private bed rooms accommodating two people each, formal dining room, large living room, large family room with stone fire place, lanai, swimming pool and the same great food we have served for years. The minimum-hunting pressure with appropriate rest periods, intensive habitat management, and the year-round feeding program have enabled Cedar Knoll Hunting Lodge customers to experience a success rate of well over 70% on bucks 2.5 years or older averaging approximately 8 points and 15 inches in width and a similar success rate on hogs in recent years as our owners have continued to hone their approach. The Cedar Knoll SC Hunting Lodge was founded in 1985 in the Low Country of South Carolina, a region generally considered by wildlife biologists to contain "the best deer habitat in the world." Therefore, the owners, Hayward and Dona Simmons, would have been able to maintain an abundant white-tailed deer population without any manipulation of the deer herd or habitat. However, the natural capacity of the habitat alone did not meet their objective of "providing the highest level of hunter success on quality deer in a free-range setting in the country." As a result, in 1985, Cedar Knoll SC Hunting implemented a broad-based habitat management program and an unlimited year-round supplemental feeding program designed to increase all types of wildlife, especially white-tailed deer. Since that time, Cedar Knoll Hunting Lodge has evolved into one of the most intensively managed hunting properties in the Southeast, maintaining one of the highest documented concentrations of quality deer in the nation (densities exceeding 200 deer per square mile). 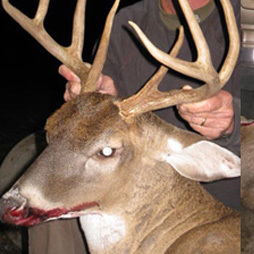 However, since a high deer population alone doesn't guarantee a hunter's success, the Simmons also set up a unique strategy for hunting in South Carolina for their deer and hogs to further ensure that their clients would be able to harvest trophy deer and hogs on a consistent basis. This approach includes avoiding times that are historically less productive and targeting prime hunting times with appropriate "rest periods" between hunts to allow the deer and hogs to return to their natural and unpressured travel patterns. That translates into one week of deer hunting in August, September, and December, and only six weeks spanning the rut from early October through mid-November, with hog hunting available every other weekend from January 1st through July 1st. Contact us to schedule your stay at our hunting lodge in Fairfax, South Carolina. We offer our hunting services throughout the country, but are especially suited to folks along the I-95 corridor including those from Florida, North Carolina, Virginia, Pennsylvania, Maryland, Massachusetts, New York and Vermont.